The Planning commission of India has made a wonderful statement in its affidavit to the supreme court. According to the affidavit an individual income of Rs.25 per day is enough to push a person above the poverty line. This statement reminds me of my Ethics Professor who always believed in confusing us if he couldn't convince us. The Poverty line is now fixed at Rs 4284 per month in cities. If only such benchmark were adopted in the world of sports, Indian football team would qualify for football world cup, Sania Mirza would win a grand slam and Ishant Sharma would become the opening batsman for India. I stand 164 cms tall (Short). If the planning commission had made changes to measurements and if 1 foot had been made equal to 25 cms, I would be 6 feet tall. I can also call myself a six footer. The 21st September 2011 issue of The Hindu (Page14- Chennai Edition) stated that the Annual salaries of the top three corporate heads of India ( Naveen Jindal, Kalanithi Maran, Kaveri Maran) for the year ended March 2011 was more than Rs 140 Crores. 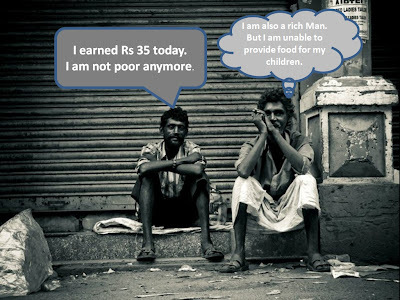 The gap between the rich and the poor is so much in India. 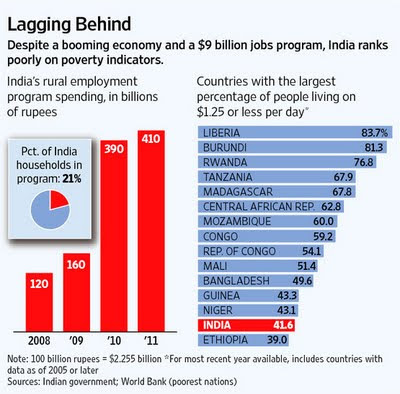 The World Bank report says that India is one of the poorest countries in the world. In fact the poverty indicator line pushes India below Bangladesh according to that report. Why is the planning commission making such statements? Anyone spending more than Rs 965 per month in Urban India and Rs.781 per month in Rural India will no longer be called as poor. (Rs 32 per day in Urban cities and Rs 26 per day in Rural villages). To add salt to the injury, the fuel prices are going up. We would not mind all these inflation in every single area in our society as long as it does not affect us. We would sit in front of the TV and watch the indefinite fast stunts and the MODIfied definite fast stunt shows. We would listen to NDTV's version and TimesNow version of a story and would assume that as News. India's growth in the MDG (Millenium Development Goals) program set by the United Nations is pathetic. The following graph according to the statewide development in India shows that more than 85 % of houses in Jharkand do not even have sanitation facility. It is also the home state of our India's cricket captain - Dhoni. It always feels good when someone appreciates you. But that does not mean that we ought to prove to the world that we are rich when we are not. The planning commissions health diet suggestion will be snubbed even by my pet dog. If I have to live a healthy life according to the Planning commission, then I have to drink 85 ml of milk , three teaspoons of rice mixed in 20 grams of dhal curry. My 7 year old neighbor laughed at me when I told him about the Planning commissions affidavit. The whole nation was going all gaga over all the media frenzy maniacs who fasted in front of television. Do we know that many in our country have nothing to eat and hence end up fasting for many days. What is our response to them? I am sick of all the Babas and the Modis and all their stunts. I am gonna go on an Indefinite Fast to protest against all those who say that they are going to fast for a cause. I am sick of seeing the fuel prices hike. I am sick of the economic crisis that is trapshooting us from down-under. I am angry. Really angry. OK. I have ranted enough. Let me go and watch some CLT-20 action on TV. Chris Gayle is gonna hammer; the cheer girls are gonna hover and Ravi Shastri is gonna stammer. If you really feel like doing something for our country, you can make a change in the life of a child living in poverty by helping him/her to have education, food and health care. Click this [link] to Help A Child of India. Chalo, let's get together and disucss this poverty alleviation program stuff over some cheese and champagne in a star hotel. Sir, You can be extremely funny and still convey a strong message. We experienced it when you came to SRM. When you sat on the dais, my friend turned to me and said " What is this guy gonna talk?". We did not know the knowledge that you came with that day. We were actually waiting for a chance to nail you down with our questions but then when you took hold of that mic, you rocked us all with your talk and your marketing Jokes. You simply rock sir. I would like to rate this blog as ever best blog......! I believe it was 21 September 2011 not 2001, since i read that in Bangalore Edition too. thanks magpea. yea wanted to place the help a child link along with the post. ravi! yea we should discuss this in a star hotel indeed. gopi : yes 2011 it was. and not 2001. thanks for pointing that out. corrected now.